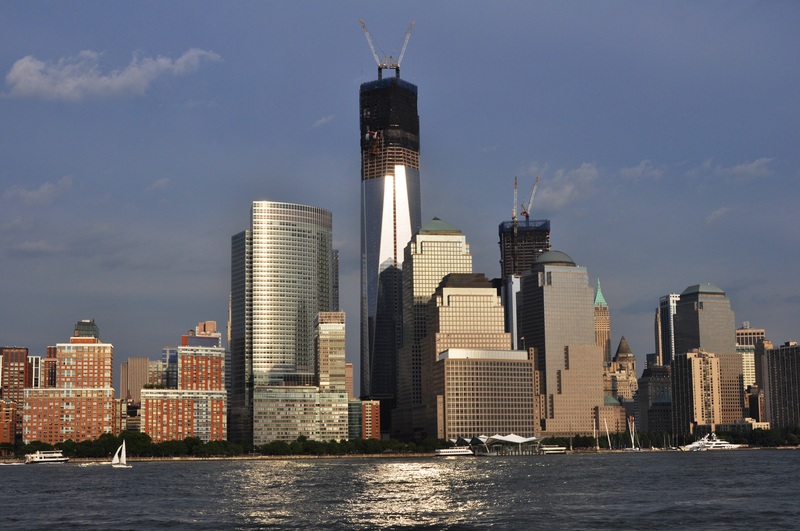 Rebuilding at the World Trade Center site, viewed from the river, July 2012. 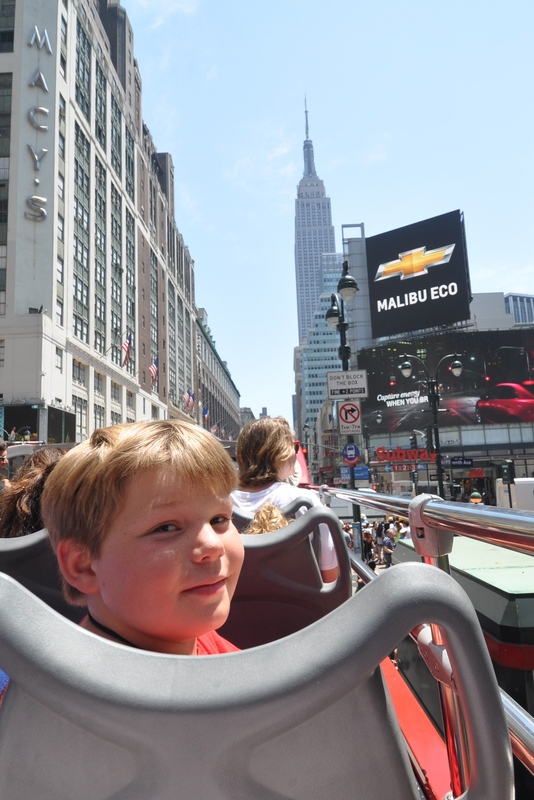 Taking an 11-year-old to New York City the week before the 4th of July was an experience that our family will always remember. That said, if we were in this situation again, we’d do things differently. To start with, we’d abandon our usual sleep/wake patterns, and schedule a siesta (or at least a nap) in the heat of the afternoon. We live in Texas, and spend a fair amount of time in California, Arizona, New Mexico and Nevada. So heat doesn’t necessarily bother us in our day-to-day lives. But a 100° day in Manhattan has problems that a 100° day in Dallas does not. In Dallas, we just walk from the house to the car…crank up the AC…and go to whatever air-conditioned venue we have in mind. Shopping malls, gyms, museums, restaurants, office buildings, libraries — they’re all air-conditioned. Usually to the point where a light sweater or jacket is a useful thing to have on hand. In Manhattan, they tell me that the subways, taxis, and buses are air-conditioned, and that most buildings are, too. You couldn’t prove it by me. We got into very few forms of transportation that had working AC that was actually cool. Then there’s the walking and the waiting in lines. Many of the public buildings — notably the Metropolitan Museum of Art and other museums — were so terribly hot that I actually saw people pass out from the heat INSIDE. I nearly did the same at the Empire State Building after a 2 1/2 hour wait in line. So, aside from avoiding afternoon heat at all costs and going out for late-night activities, the thing we’d most likely change before going to New York City again is to change the time of year we went. 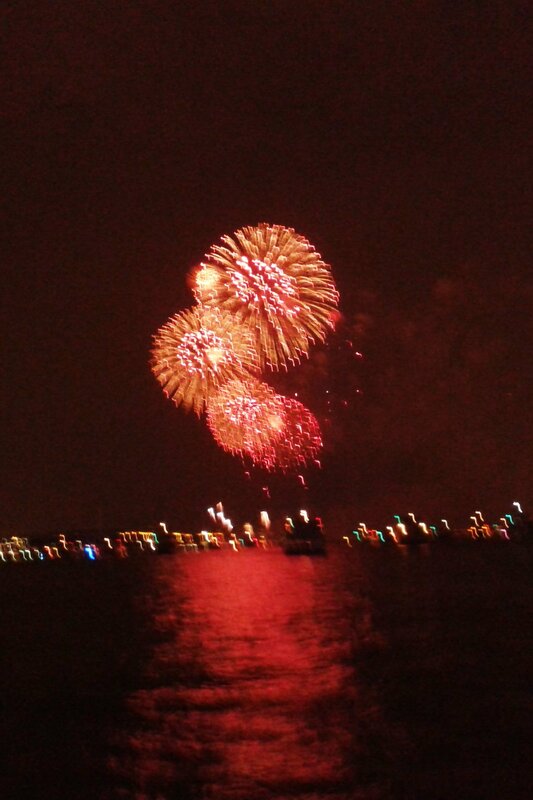 Our 11-year-old had been to a performing arts summer camp in the Catskills, and since we were picking him up there (and watching his end of camp show) on June 27, we decided to take in the fireworks over the harbor and show him American history from the New York perspective over the Fourth of July. Everyone said, “Oh, the good thing about being in the city on the 4th is that everyone who can get out of the city does, so it’s not nearly as crowded.” I missed something in translation here. “Not nearly as crowded” for Manhattan translated to multi-hour waits for many attractions (the Statue of Liberty, the Empire State Building, the World Trade Center memorial, many popular restaurants where — even with a reservation — we weren’t seated until an hour or more after our scheduled mealtime). Thanks to a ship’s captain who was pointed in the wrong direction, this is the only part of the July 4 fireworks show I saw. The rapid turns he was making to try to keep it in view made it impossible to stand still on deck — and the blurry photo speaks for itself. Hardly worth the $750 price tag for the cruise that promised a gourmet meal and “spectacular” views — especially when the food was awful besides. The captain of the “yacht” obviously didn’t know where the fireworks were going to be — and we were facing the wrong direction when the show started. A series of almost dizzying turns throughout the show meant that no one had a decent view of the whole show, and everyone missed a major part of it. Getting pulled over and ticketed by the harbor police wasn’t much fun, either. The disc jockey providing music for the “family” cruise we booked obviously didn’t understand the words “family” or “patriotic”. The hip-hop music he blared was so offensive some of the passengers staged a near mutiny, and his idea of patriotic music for Independence Day included the Guess Who’s American Woman, Bruce Springsteen’s Born in the USA, Credence Clearwater’s Fortunate Son, and Metallica’s Don’t Tread on Me. As it happens, I like all four. But none is a patriotic song suitable for the 4th of July. Like many other places and vehicles we ran into, this “yacht” had many windows that wouldn’t open, and just one tiny window air conditioning unit to cool the entire cabin. The top deck filled up in the first five minutes of boarding, leaving most of us downstairs. Long before the fireworks started, resourceful gentlemen were simply using whatever tools came to hand to pop the windows out, leaving the ship owners with the need to replace them. I think one of them may have gone outside, landing in the river, but it was on the far side of the “ballroom” from me, so I am not sure. Finally, the company required that tickets for the cruise be picked up in person at an office in Times Square. The wait to pick up tickets — which were paid in full online months before the date — was another 2 1/2 hour session in a crowded place with no air conditioning. On the Grayline Tour Bus. Wish we hadn’t wasted the time or money! Gray Line Tour. I’ve taken Gray Line tours in many cities, and never had a bad experience until this trip. But even though we got the tour free thanks to the New York Pass, it wasn’t worth the cost in time, hassle, and disappointment. Serendipity. This “must try” restaurant was interesting…and the frozen hot chocolate and other desserts were good. But the prices were quite simply mind-boggling. And the wait staff was over worked, rushed, and bordering on rude. The food — aside from the desserts — was pricey and absolutely ordinary. Not bad, but not worth the price. (For the record, I’m not price conscious when it comes to good food and good times. But I do dislike overpaying and thinking, “Gee, I passed a less expensive place down the block where the food is better.”) The tiny, crowded restaurant wasn’t overly clean, either, and the long lines for the single-person restrooms snaked by our table, resulting in a less than optimal dining experience, too. The Terra Cotta Warriors exhibit in Times Square. This wasn’t as bad as the bait-and-switch advertising for the Dallas Museum of Art’s King Tut exhibit a few years ago, where the famous Tutankhamun mask which adorned the museum and all its ads for months before the exhibit was about 800 miles away in Atlanta while lesser relics were in Dallas. But the ads promised “we’d marvel at the life-sized warriors and over 200 treasures.” Take note of the importance of the conjunction in that sentence. I was expecting to see the whole army of warriors — but, of course, that is NOT what the ad promised, and it certainly wasn’t what we saw. At $25 per person, it was affordable by NYC standards, but certainly not a value. We expected a live stage version of the Disney movie; that isn’t what we saw, and we were (sadly) bored. 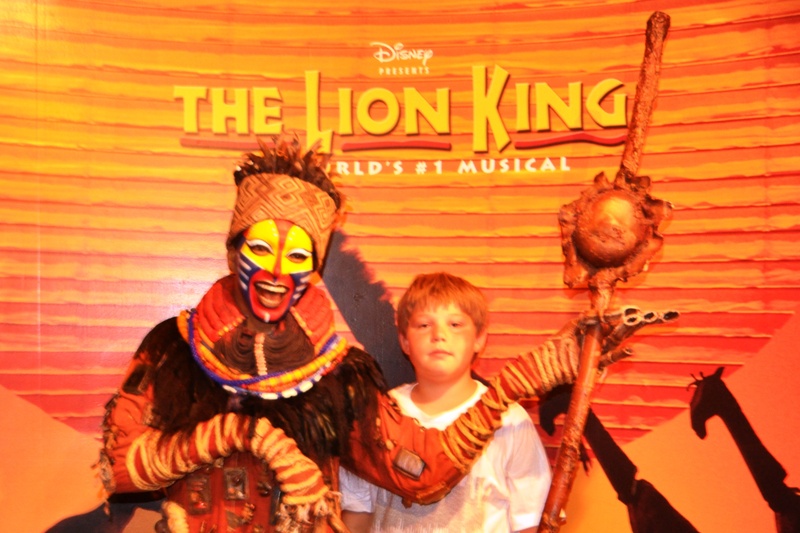 The Lion King at the Nederlander. We paid $155 each for three balcony seats, and while we could see the stage, and parts of the show were amazing, the show was quite frankly boring. Once we got used to the wonderful puppets and dancers, there was too much “fill” that didn’t tell any of the story and seemed to exist solely to allow the dancers and singers to show off their mastery of African tribal dance. I saw more than one child falling sleep by the end, and Kameron was no exception. He didn’t fall asleep, but he was clearly bored — and so was I. Before I go on to the final thing I’ll do differently next time I’m in Manhattan with children, I want to list the things we felt were a good value — and the ones that we felt were outrageously overpriced. Others may disagree with my list, but this is my feeling based on the costs and enjoyment factor. Roosevelt Island tram at sunset. Best $2 spent in the city. Staten Island Ferry in the early morning hours. Free! Waldorf Astoria Hotel. I’ve stayed at many hotels in New York City over many years, and I keep coming back to the Waldorf. It’s simply the best — big rooms, nice bathrooms, excellent staff, and great prices. Tip: Use your Hilton Honors rewards points or VIP status to get upgrades and lower rates. Street vendors at Lexington & 50th, July 1, 2012. Food at one of the weekend “pop-up” street festivals that seem to happen in New York City nearly every weekend. We stepped outside our hotel, and there it was: blocks of little white tents on 50th, stretching off in both directions. Amazing smells wafted from vendors, and the $5 chicken kabob I got from a street vendor were the best food I had in a week in the city. The shops had a range of goods, and we spent a happy hour or so wandering through them before we had to get off to another scheduled activity. Jekyll and Hyde’s restaurant in Greenwich Village. Dylan’s Candy Bar. While it can’t compare to the Remarkable Sweet Shop in terms of selection or value, I was pleasantly surprised at the relatively low cost of sweets and treats at Dylan’s. In a city where an 11-year-old can spend a remarkable amount of money in a very short time, Dylan’s is a place where $12.95 will go a long way….I think we still have candy left over, a month later. Improv 4 Kids, at the Broadway Comedy Club, was another bargain we found on the site. A lovely break for everyone from adult-oriented comedy, with the sort of modern-day vaudeville feel that can be hard to find. Last, but not least, we got heavily discounted tickets for Cirque du Soleil’s Zarkana — a show we wouldn’t have seen if we’d had to pay the full $179 per ticket price. Any time you see a show at Radio City Music Hall for less than $60 per ticket, you’re lucky. But when you have a circus-loving child and get to see Cirque du Soleil at a bargain price from great seats, it truly is an amazing value. South Street Seaport and Museum. If you like Pier 39 in San Francisco, and the Inner Harbor in Baltimore, you’ll like the South Street Seaport. It’s the same kind of mix of museums and attractions, restaurants, shops, street performers, tall ships, and atmosphere. It’s the city itself — great architecture, amazing polyglot culture, and constant hum of activity — that’s the big attraction. And much of that is free. You get quite a show just walking down the street, and if you rely on locals for advice and tips on the best deals, you may be surprised at how affordable it can be. I certainly was! The last thing I’d change about our trip — aside from the weather and the timing — is that I’d change the days of the week we were in the city. We arrived and left on a Thursday, meaning that we had just one weekend in the city. 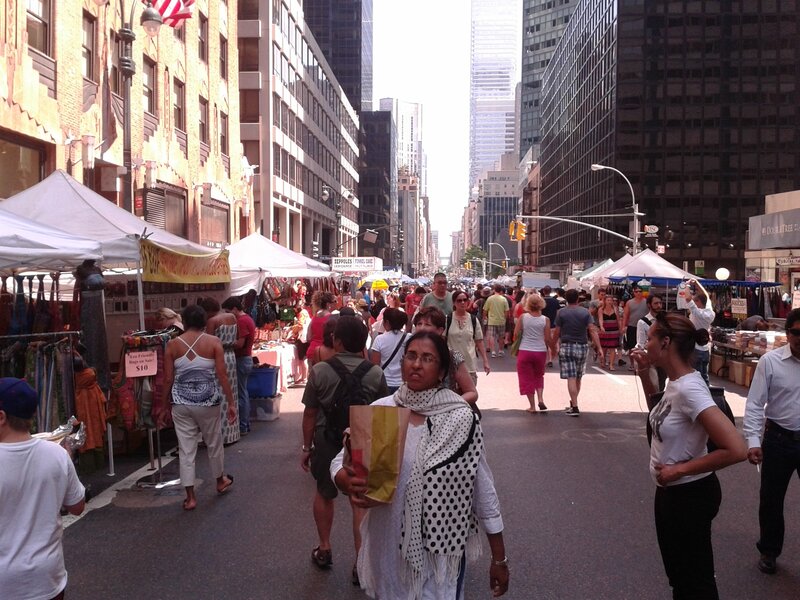 New York City in the summer is filled with things for families to do on the weekend — and if I were going to spend the same number of days in the city (8), I’d schedule it so that I had two weekends in the city. We just didn’t fit in everything we wanted to do, largely because so many things were scheduled on the weekend (matinée performances, for example). Chelsea Pier. The big entertainment and sports complex looks amazing, and the families we talked to who spent time there raved about it. Trapeze New York. Yes, I know it’s an acquired taste, but our circus-loving kid would have, well, loved it. The Intrepid and the new Space Shuttle Enterprise. We saw the battleship and its amazing collection of warbirds, but the Enterprise exhibit wasn’t open while we were there. More time outside Manhattan. Brooklyn. The Bronx. Queens. New Jersey. Coney Island. The Hamptons/Long Island. Places we could (gladly) have stayed longer. Next time I decide to vacation in New York, I think I’m going to spend more time upstate. The Finger Lakes region where Kameron attended summer camps was gorgeous. For parents day, we couldn’t find a hotel nearby, and wound up staying at one of those Catskills resorts that I’ve read about (and saw in Dirty Dancing), but didn’t think really existed. The Villa Roma was without a doubt the cheesiest, most stereotypical resort this side of Las Vegas. We loved it. HUGE rooms, all-inclusive pricing, and enough activities to keep kids and adults busy for weeks at a time. We didn’t even skim the surface of the activities available there in the two nights we spent there. Kameron was with us the second night, and the half-day before check-out time the day after camp ended. I think his biggest regret about the trip was not staying at Villa Roma longer, and I understand why. Family resorts seem to have made a resurgence in recent years. We’ve even got one in Texas now, a sort of a summer camp for the whole family, with organized, scheduled activities for toddlers to great grandma. I could be critical of the decor and the uniquely ethnic clientele, but the truth is that it was exactly what it promised to be: a family oriented resort. And, in the end, isn’t that what we all want in a vacation spot? A place that delivers what it promises? Gallery | This entry was posted in Family and tagged family travel to NYC, New York City tourism, summer vacation in New York, Villa Roma Resort, Waldorf Astoria Hotel with Kids. Bookmark the permalink. So you DID do the Roosevelt Island tram. Wasn’t it great? Personally, after 15 years of living there, I would only visit NYC in Late April/Early May or October. Those are about the only times you can be pretty sure you will get bearable weather. Having suffered through way too many summers with 100+ degree heat, though, I’m surprised that the A/C in the buildings was so bad. Subways, buses and taxies were always problematic (and the subway stations have never been air conditioned), but at least you could count on the buildings being air conditioned. Perhaps Con Ed (the electric utility) has raised the rates so high that everyone has cut back on A/C. Very scary to hear that people were passing out in places like museums.